Do I get a real number? Yes! To the person faxing to you, it looks and acts like any other fax number. When someone faxes to your number, the fax is converted to a file that is emailed to you as an attachment instantly. Once your FlexiFax account is activated, you can login to your FlexiFax control panel and configure the email account you want your faxes to be delivered to. By default, it is set to the email address you specify in your order form. When someone faxes you a document, you’ll receive the fax in your email inbox as an PDF attachment. Just double click the file to read it. You'll be able to check your faxes anywhere you can check your email. With FlexiFax, all your faxes will be delivered directly to your email inbox and you can easily forward it for free to any other parties, print it, store it, rename the file and much more. Can I send out faxes? Certainly, once you sign up for a plan that allows you to send faxes, you can send faxes from any Internet enabled devices that is capable to send email. 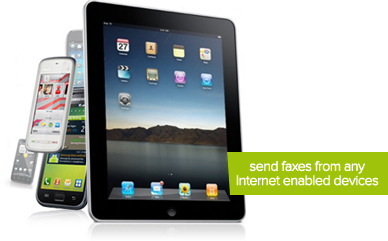 You can even send a fax from your smartphone or tablet such as iPhone, Blackberry, iPad, and much more. FlexiFax is compatible with Email software/services such as Microsoft Outlook, Thunderbird, Eudora, Opera, Microsoft Outlook Express, Web based email clients, gMail, Yahoo Mail, Hotmail and much more. 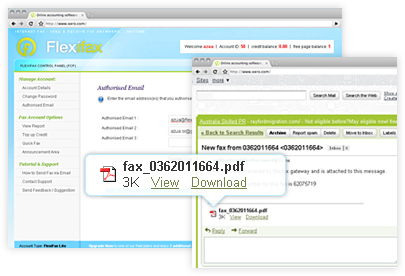 It's easy to send a fax with Flexifax. All you need to do is to attach the document you want to fax to your email and email it to RecipientFaxNumber@send.flexifax.com.my (ie: 0362075400@send.flexifax.com.my for KL/Selangor or 055505434@send.flexifax.com.my for other states in Malaysia). Your intended recipient will receive your facsimile document as a fax through their fax machine. Can I save my faxes? Of course. Simply save the email message or save the PDF attachment onto your computer. You can even rename the PDF document for easy searching and archiving. With the years of experience in telephony and IT infrastructure building, we are confident that FlexiFax is as reliable as any fax services available out there. We believe our fax has even better quality because all documents are digitize before it is transmitted and all transmission is through a digital network. On top of that, we can assure you that the fax sender will never hit a busy signal with your fax number. All FlexiFax customers have access to our Online helpdesk as well as Telephone support without any extra charges.